When I was in High School, Def Leppard was huge. They had just released Pyromania, and it was just great fun rock and roll. The band always made me think of a bunch of kids who just wanted to get laid and make money, a sort of garage band that got huge, somehow. At the same time, they had some great songs and despite horrific tragedy that wracked the band over and over still are rocking today. Their follow up to Pyromania was Hysteria, which was a huge seller, but felt too polished and packaged to me. It lacked the raw kids energy and rock and roll vibe of their previous work, which hurt them, I think. Still, millions of strippers owe Def Leppard a great deal for the song "Pour Some Sugar On Me" and it had some great songs, even if they were kind of cheesy pop. 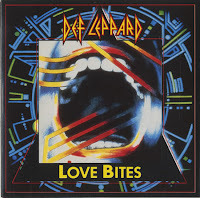 One of the stand out songs is "Love Bites," which while sounding a lot like the hair "metal" bands of the late 80s such as Great White and Poison has lyrics that are pretty powerful. And that's what this series is about: lyrics. While the music is not particularly noteworthy, it doesn't get in the way of the songs and unlike most similar bands of the time actually did rock. "Love Bites" is about that point in a relationship when you realize she doesn't love you. You know it but just cannot give up, and its all the questions you ask as you look in her eyes and listen to her lie to you. The song is about how the love has died on her end, at least, and what you go through as you really come to understand that horrible feeling in your gut that's been building for all this time. This is the kind of song you sit and listen to, bawling your eyes out, when she's broken up with you and the world seems pointless. Why would she do this to me? What did I do to make her hate me so much? Where does love go? In some strange way, it helps you heal. As glorious and soaring, and sacred as love can be, it is hell on the other side. When it falls apart, love is one of the ugliest and most horrible things imaginable, largely because of how beautiful it is. That violation of something so divine and beautiful is darkly hellish in its corruption.